Getting Around in Chiang Mai. There are various types of public transport in and around Chiang Mai. For the visitor to Chiang Mai, every type of vehicle is available for hire in Chiang Mai for you to drive or ride yourself. Motorcycles, cars and bicycles are readily available for hire. You can also hire a driver, or a rider if you wish to use motorcycles. If you wish to have a taxi for a day this can be arranged. Urber is available in the city and beyond. A group of about 5 to 10 or more people can hire a seated van for a day or just for short trips. There are little three wheeled taxis that can take 2, 3 or 4 people, called a tuk-tuk. Then we have the common transport system which is also called a taxi, red taxis and yellow taxis. And the motorcycle taxis, the cheapest of all motor vehicles to hire. 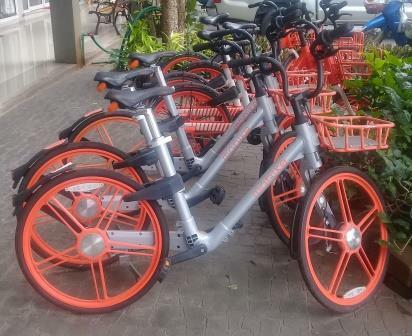 The bicycle hire services are very popular in the city and suberbs. Note:- If the taxi or tuk-tuk is always parked in the same spot, outside your hotel, than they are generally reliable, the reason being, if they cause trouble for the customers, the hotel will have them moved on. At the airport, bus and train stations there are taxis available. If you know exactly where you need to go than hire a taxi and see that the meter is turned on. If you don’t know exactly where you are going you can talk to the drivers before you get into a taxi and negotiate a price to take you to an address or just to take you to the old city. A good place to get dropped off is Tha Pae Gate, it is in the old city area and a short walk to many hostels for tourists. 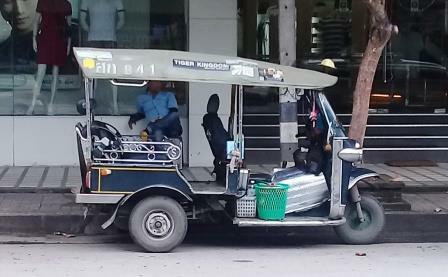 Sometimes tuk-tuks are at the airport, they are most often at the bus and railway stations. It is wise to negotiate a price and to know exactly where you are going before getting into a tuk-tuk. Even if you tell the driver where you want to be dropped off, you can sometimes be taken to the wrong spot. So, don’t rely on the driver to know everything, best if you know where you are going. You may wish to tip the drivers, tipping is not expected but is always appreciated. A tip of 20 baht is enough for good service. The red or yellow taxis. They are a pick up truck with a bus type body and the passengers sit on benches along inside. The idea is, you hail the driver if he is going in the direction you want, ask the driver by saying where you wish to go, get in the back and wait till you are near your destination, pull the cord and when the taxi stops you walk around to the passenger window and hand the driver 10 or twenty baht or more. You can also use these red and yellow taxis as your private taxi but the cost is much higher. Many drivers have regular bookings and are not available always. I don’t know a lot about Urber but my friends have used the system and seem to like it. I believe it is cheaper than a taxi. A half hour ride in the Urber car cost my friend 300 baht where the taxi was 500 baht usually. If you are living in Chiang Mai permanently, you would own a car or motorcycle, or both. Second hand cars are expensive here, not like in Australia. The registration and upkeep of the car is not very expensive, in fact, registration of a motor vehicle is very inexpensive. Without a car you can travel to most destinations by red taxi. This is the most economical way to get around. After school the taxis are often full of kids and shoppers and you might need to wait for a less crowded one. You simply wave them down, get in the back with the other passengers and get out where you wish. When you want to return, just catch another red or yellow taxi back. So, summing up, when you first arrive in Chiang Mai you head to your room by taxi and it should cost you no more than 500 baht by taxi. Then you might feel like some easy exercise so you walk around town or hire a bicycle. Many bicycles have a computer which can be programed to take a fee through your mobile phone, you can abandon these bikes whenever you wish and the owner will retrieve them. 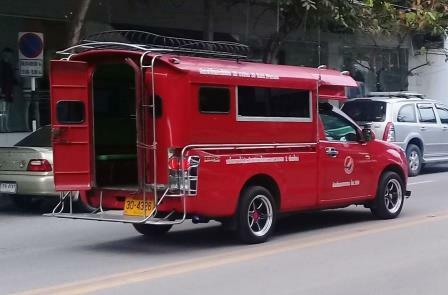 After a while you feel like going somewhere in a red taxi so you catch the taxi around the city and back to where you started, this should cost no more than 100 baht, possibly about 60 baht. After getting the feel of the red taxis you might want to catch one out to the surrounding countryside and back again, great for sight seeing. If you are way out of town you ask the driver if he is going to Chiang Mai as this means into the city. You may wish to hire a big or small motorbike. If you hire a motorbike, check it out and take photos of any damage that might be on the bike so you have no fear of being accused of causing the damage. Cars are available for hire but my knowledge about them is limited, I’m sure that you could hire a car without problems. Myself, I ride a small motorbike or drive my little old Toyota.